Stipe Miocic has gone by the name of “Undisputed UFC Heavyweight Champion” longer than anyone before him. And with six consecutive victories over the best the division has to offer, Stipe Miocic may very well be the consensus greatest UFC heavyweight of all time. If he isn’t already, a victory over Daniel Cormier should solidify that. 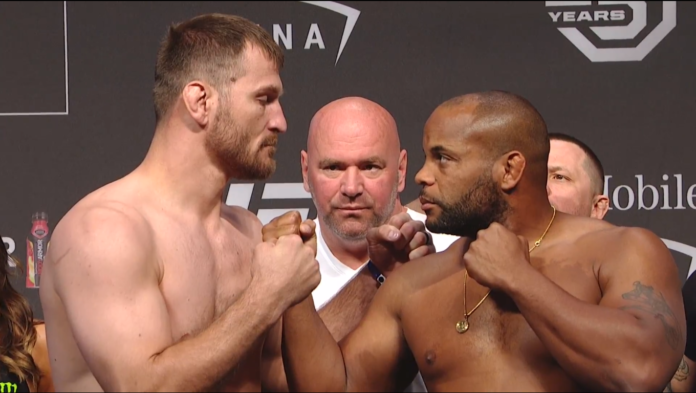 Daniel Cormier is the best fighter Stipe Miocic has ever competed against. Fabricio Werdum may have the best resume out of all of Miocic’s opponents at heavyweight, but Daniel Cormier has a better winning percentage overall and has turned in more dominant performances throughout his career, not excluding heavyweight. Daniel Cormier’s success at light heavyweight understandably overshadows his stint at heavyweight, but Cormier is not this unproven commodity in the division venturing into new territory. In actuality, Cormier has fought almost twice the number of fights at heavyweight as he has at light heavyweight. So when Stipe Miocic is listed as a -230 favorite over Daniel Cormier with the presumed reasoning being that it’s because Cormier is moving up, this does not pass the logic test. Not only has Cormier fought nearly twice the number of fights at heavyweight than light heavyweight, but he has done so with an undefeated 13-0 record without dropping a round. And his toughest opponents are universally respected heavyweights (Frank Mir, Josh Barnett, Antonio “Big Foot” Silva, and Roy Nelson), none of which, contrary to the revisionist or uninformed MMA historians, were past their primes. “Big Foot” only had two career losses coming into his fight with Cormier and was fresh off a victory over the man who is arguably the greatest heavyweight in MMA history: Fedor Emelianenko. Cormier would give Silva what, at the time, was only the second knockout of his career. Josh Barnett entered his fight with Cormier on an eight-fight win streak and, following his loss to Cormier, would go on to win back-to-back fights, including a win over former UFC heavyweight champion Frank Mir. Speaking of Mir, when Cormier defeated him, he was coming right off the heels of a championship fight against Junior dos Santos, thus still competing at a very high level. And while Roy Nelson may be overrated, seeing as how he has lost virtually each of his big fights, he is still a talented and very dangerous fighter respected as a legitimate heavyweight both from a skill perspective and a size perspective. So there is no logical reason why Miocic’s size should be considered a major factor in this fight, much less the primary reason for him being the favorite. And now that DC has officially weighed in more than three pounds heavier than Miocic, this could very well be reflected in the odds prior to bell time. Cormier has been more dominant throughout his fighting career and has only lost to arguably the greatest fighter of all time, while Stipe Miocic has two losses on his record, including one to Stefan Struve. Of course that was six years ago and Miocic has grown a lot since then, but while the loss may not mean a lot, it also cannot mean nothing. This is not to necessarily say that Cormier should be the favorite, given how dominant Miocic has looked leading into and during his reign, but that the fight should be in the pick-em range, given that Cormier is someone who has only lost to Jon Jones and never at heavyweight, while Miocic has two losses. And if we are banking on Miocic’s punching power advantage, Cormier has also only been knocked out once in his career, which, again, was to the hardest fighter to defeat in MMA history. And according to the record books, even this knockout did not happen. Plus, anybody who can take the best shot of Anthony “Rumble” Johnson can probably take just about anything thrown his way. The only logical reasoning behind the odds has nothing to do with size but may be because gamblers and the bookmakers believe Miocic’s wrestling background is enough to keep the fight standing, which seems like a big gamble given the much higher level of wrestling credentials Cormier possesses and how well Cormier uses it (and his clinch game) time in and time out. It is because the odds should be closer and because DC is so good that this fight means more to the champion, even though there seems to be more talk about what a win would mean for Cormier. This fight means more for Miocic because even with a victory for DC, there would still be more debate over his place on the GOAT list than there would be about Miocic’s place on the UFC heavyweight GOAT list. Miocic’s place as the heavyweight GOAT from a resume standpoint would be iron clad, and he, too, would now begin forging his case for a place on the pound-for-pound GOAT list. If Miocic keeps winning, who’s to say that this fight might not be the biggest piece of evidence for Miocic’s own GOAT argument someday? For DC, a win would still not be enough in the eyes of most to put him above GSP, Demetrious Johnson, or Jon Jones in particular given the results of both their fights (many fans do not write off these losses, especially the first one). In essence, even with a win DC will neither be the greatest heavyweight of all time nor the greatest fighter of all time in the eyes of the majority. Meanwhile, a win for Miocic would, in the eyes of most, make him a shoe-in for the placement at the top of the UFC greatest heavyweight of all time pecking order, if not the greatest MMA heavyweight of all time, while also leaving the door open for a potential GOAT argument of his own down the line. And if you doubt that Miocic could walk through that door, he’ll be the first to tell you how much he enjoys proving doubters wrong.